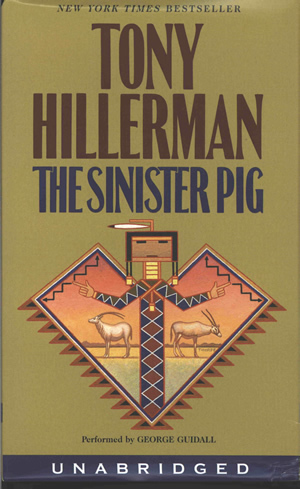 This is the unabridged audiobook version of The Sinister Pig, published in 2003 by Harper Audio. It is narrated by George Guidall and comprises 4 cassettes, 5.5 hours of recording/listening time. The full-color cardboard cover displays the drawing from the first edition by Peter Thorpe, featuring Yei figure with outstretched arms and two oryx, exotic gazelle from Africa and the Arabian Peninsula, grazing on either side. The overall cover color is dark tan. The back cover displays praise from the St. Louis Post Dispatch, a synopsis, brief biographies of Tony Hillerman and George Guidall, copyright notice, publisher information, barcode and price.